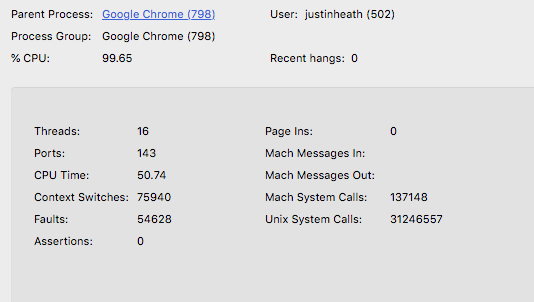 I recently noticed that a certain tab in Chrome was using essentially 100% of a CPU core. The issue happens every time I am logged into the web app my company develops. There is an open web socket (with usually only heartbeat pings), but other than that the site is sitting idle so should not consume any (or very little) CPU. 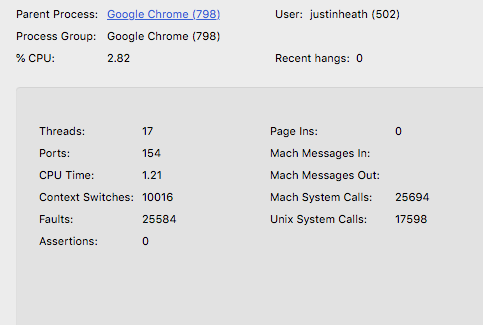 I have logged into the webapp using Chrome on a recent MacBook, MacBook Air and MacBook Pro and none of the 3 exhibited the same behavior. I have logged into the webapp using Safari on this same machine and it also does not have the same issue. I have logged into another account/user on this machine and do have the same issue while using Chrome. I have uninstalled/re-installed Chrome. Run a few system adware/malware programs and additionally upgraded to High Sierra and the issue still persists. I don't have any other potential smoking guns except for the Unix System Calls (which I have not observed spiking on any other processes since seeing it). I just would like to know what could potentially cause this spike, and how to go about the next steps of debugging the issue. If there is potentially another issue that you feel I should look for, please share those as well. Browse other questions tagged google-chrome unix performance cpu activity-monitor . kernel_task is using 90% CPU, what could be the cause? How can I determine why keyboard response is intermittently very slow with large display?